Shopping for View-Master Preschool Toys? Take a look at our huge selection of Action Figures, Pop! Vinyl Figures, Statues, Construction Toys, Mini-Figures, and Key Chains! 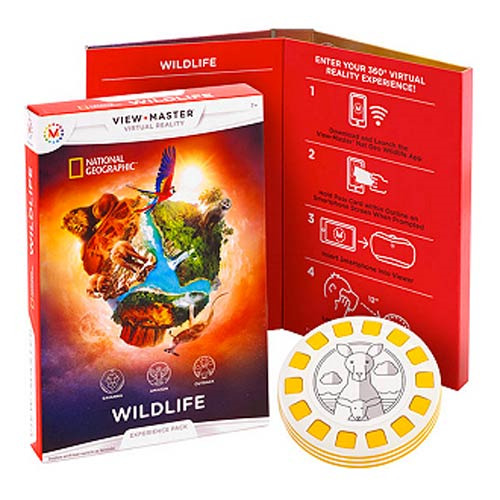 The View-Master Nat Geo Wildlife Expansion Pack allows users to explore the unique lands of the Earth with a simple click! Take a 360 degree virtual tour with the Nat Geo Wildlife Expansion Pack. This Nat Geo Wildlife Expansion pack includes 3 reels of the following places: African Savanna, the Amazon, and the Australian Outback. Smartphone and VR viewer required for use, not included. Contains: 3 Experience Reels, and 1 Pass card. Ages 7 and up.